Hope you had a wonderful start into 2010. Wishing you a safe, happy and healthy 2010! Reflecting on 2009, I’ve had an enjoyable food blogging year and look forward to another year of good food, fun and cheer. 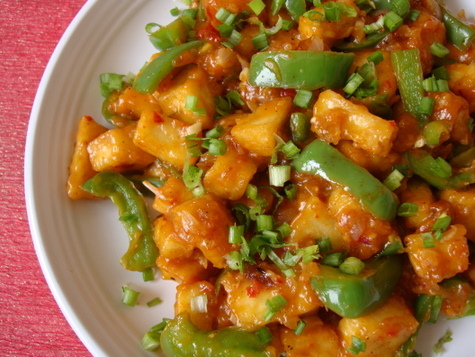 I’m beginning the new year with a favorite appetizer, Chilli Paneer. Last week, I prepared a vegetarian Indo-Chinese meal consisting of Sweet Corn Vegetable Soup, Chilli Paneer and Vegetable Soft Noodles with Schezwan Vegetables. Control the level of spice by reducing the amount of red chillis. Use spring onion white and greens for that authentic restaurant-style appetizer look and flavor. 1 Heat oil in a flat non-stick pan, place the thinly coated paneer pieces next to one another and shallow fry till brown. Flip over and let it brown the other side. Remove and keep aside. 2 Heat a heavy bottomed vessel, pour the left over shallow fried oil (if necessary add 1-2 tsps more oil), add the chopped ginger and garlic and saute on high flame for about 30 secs. Add the chopped spring onion whites and saute for 2 mts. Add sliced capsicum and stir fry on high flame for 2 mts. Add red chilli paste, tomato paste, soy sauce, vinegar, sugar and combine. Add the sauteed paneer and toss for a mt on high flame. Add 5 tbsps of water and adjust salt if necessary. 3 Add the cornflour water and combine on high flame, tossing the contents, for 2 mts. You will find that it becomes thick due to cornflour. 4 Add the chopped spring onion greens and combine. Garnish with more spring onion greens. Serve hot as a starter/appetizer. Alternately, you can deep fry the marinated paneer till golden brown and follow rest of the procedure. Made chili paneer today!! One of our family favorite. Looks gorgeous! Wish you & your family a very Happy New Year! Delicious recipe. Happy new year Sailu.And as always thank you for sharing your recipes. Happy New Year to you, your family and Nehal too Sailu! 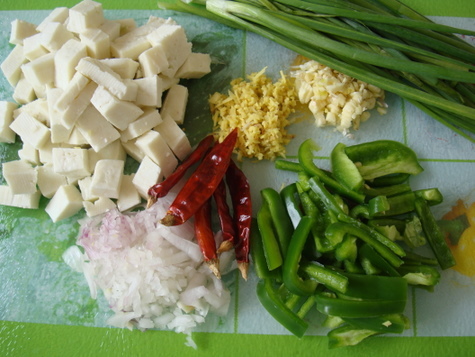 We look forward to good food on your blog too!Chilli Paneer looks absolutely stunning! 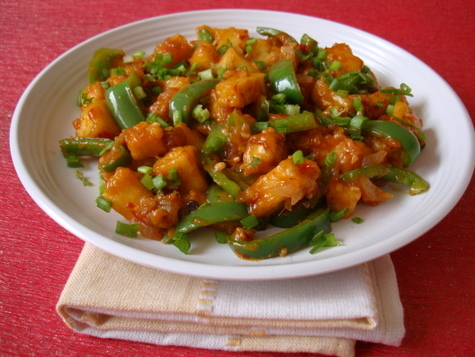 Sailaja, Happy New Year, love your chilli paneer would love to give this a try. thanks for sharing this wonderful and easy recipe..
a) any substitute for cornflour? b) the water used to soak chillies (for the paste) needs to be discarded or is it used elsewhere? You can use maida/all-purpose flour instead of cornflour. Use a little of the soaked water to grind the paste. You can use the remaining water while cooking the paneer. But it will increase the spice. Happy New year Shailu! Thanks for your wonderful recipes, I am a big fan of yours! Thanks Sailaja, looks yummy. Please let me know what brand /name of vinegar i need to use, i am using vinegar for the first time.Once again thanks and enjoy a delicious new year with your friends and family. I recently bumped into your site while searching for recipes. After I came to know your site I stopped visiting other sites for recipes. Hats off to your passion and patience towards cooking. And your photos looks amazing and mouth watering. 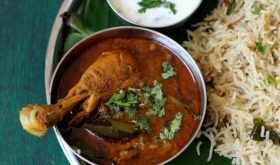 I miss all the Andhra food, when I see your recipe photos I feel like coming to India to just eat food. Happy New Year to you and your family and keep up your great work! 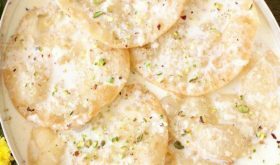 Looks soft & juicy….. Well mine does not… Bookmarked it for my next…..
thank you very much sailu for your good wishes and wish you & your family a very happy new year too. thanks for your wonderful recipes. Please send the receipe of Capsicum Paneer Masala. Happy New year!! hope u have a wonderful time blogging new recipes. Somehow i find ur blog very confusing..i thot u wud revamp for the new year..yes i saw new pics. but what is the featured gallery….and we dont know which were the latest recipes..i wish it was simpler. i m ur fan. i like ur way of presentation, writing and appreciate ur wisdom. i have not shared with u, that from the last two years I regularly visited ur site n taken a lot of help. i salute u for ur contribution and ur love for food, care u take for beginners in the kitchen. thanks for being frank in approach. Made this yesterday = yum!! I love your Indo-Chinese recipes. Thanks! This paneer recipe looks amazing. Thank you very much. 2. Did not find Soy Sauce, any substitite? Waiting 2 cook this delicious paneer recipe. Use the non-fruit vinegar. No substitute for soy sauce. Worchester sauce is different from soy sauce. Sailu ji, Chilli paneer turned out very very well. Thanks a million. 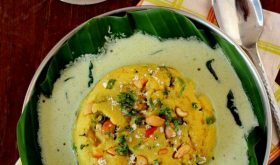 Please try uploading Khichidi recipe if possible. Thanks once again. Dear Sailu, When I fried the paneer it stuck to each other and got a bit rubbery. Could you kindly advice what could have gone wrong. You have to use fresh paneer. Heat a cup of water in a vessel, place the cubed paneer pieces and cook for 3 mts. Turn off heat. Leave aside for 5 mts. Strain the water. Follow rest of the recipe. While frying, drop each piece of paneer into the oil and not like a lump of few paneer pieces sticking together. Can you send me some new, easy and tasty Veg recipes for my daughter’s lunch box. she takes chapattis daily to her school. would it work to substitute paneer for tofu? I tried this recipe yesterday. It turned out fabulous and I just loved it. 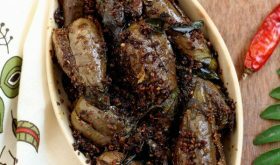 In this recipe at one place u have mentioned the marination time as 1 hr and and at other as 10mts. Which is the correct one? Pls clarify me. I want to try this recipe. Came out perfect. Thanks for all the wonderful recipes. Now, I can’t wait to try your other posts. I thawed the frozen paneer. 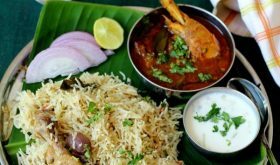 Once it is soft, I cut it into pieces and while frying it, paneer got stuck on the pan… it became mushy.. more like grated one.. Can you give me any tips to avoid this? I need paneer to remain in cubes.. not mashed..